At the beginning of the year, Scullen families were provided helpful information about routine school procedures. As the year goes on, we would like to remind you of some of the most common situations that arise and how best to handle these situations. Scullen staff greatly appreciates your following these guidelines. For a complete copy of the "Communication Tips" document that was provided at the beginning of the year please go to the link below. Thank you. Please note... the number to call when reporting an absence or tardy IS NOT the same as the main office phone number!!!! Please leave your name, your child’s name (please spell the last name), grade, the reason for the absence (or tardy), and how long your child will be out of school. Unless you have given us advance notification, please call us each day that your child will not be in attendance. Early Dismissal Procedure – Please review! Send a note with the student (including student’s name and grade) stating the time, date and reason for early dismissal.The student should bring the note to the Main Office first thing in the morning upon entering the building. The student will be issued an “Early Dismissal Pass” that will allow the student to leave class, gather his/her belongings, and be ready to be picked up in the Main Office. 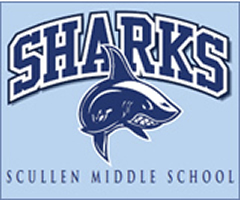 If you are unable to send a note with your student first thing in the morning then we will call them for dismissal once you arrive at Scullen. Please feel free to build in extra time for your pick up so that there are no missed appointments. Ensure a parent or guardian comes to the Main Office to sign out your child. Please note: Anyone signing a child out MUST have their ID with them and be listed on the student’s contact list in E-School HAC. We would kindly ask you to refrain from dismissal requests between 2:45 and 3:00. The end of the day is very busy and we cannot guarantee an early dismissal for you during these times. Thank you for understanding. Items Dropped for Students On occasion, you may need to drop a lunch or other item for your student. Have these items dropped off by 10am. There are baskets located in the foyer along with paper and pen. Please write/attach your student’s name on the item and leave it in the appropriate grade level bin. These items are taken into the lunch periods and students are called up for their item. They can also check the bins in between classes throughout the day. Please be aware that class will not be interrupted to deliver these items. Morning Entry into the Building Students will be allowed entry into the building 20 minutes prior to the start of the school day (7:40am). On Wednesday (late start day) students will be allowed into the building at 8:00 a.m. There will be no adult supervision prior to these times. On days of inclement weather, the students will be allowed to stand in the foyer outside of the Main Office.